Are you worried about tomorrow being Friday the 13th? Are you superstitious at all about the day? There are some superstitions about gardening that you might want to give some consideration to, ‘just in case’, because you never know. Some of them might be rooted in some truth. For example, everyone knows that a passalong plant won’t grow if you thank the giver for it. Many of us also know from first hand experience that it’s hard to not say “thank you” when you are offered a free plant. After all, gardeners are generally a friendly, gracious and appreciative group of people. But with practice you can instead say something like, “that will look good with my name-that-flower” or “I have the perfect spot for that plant”. Say anything you want, just don’t say “thank you” when someone gives you a free plant. Did you know that seeds grow when a pregnant woman plants them? This doesn’t mean that you are pregnant if the seeds you sow grow, or that the seeds won’t grow if you aren’t pregnant. It just means, if you believe it, that getting a pregnant woman to sow the seeds in your garden makes it more likely that the seeds will germinate. Speaking of seeds, another superstition is that bean seeds grow better when they are oriented east and west instead of north and south. Don’t ask me why this makes them grow better, maybe it has something to do with how the sun rises and sets? Or maybe I just made this up? Whatever its origin, just in case it does make a difference, I made sure to place my seeds ‘just so’, oriented east – west, when I sowed another row of green beans this evening. I also checked on my first rows of green beans, the ones surrounded by plastic spoons. It appears that no bean plant have been touched by a rabbit, not even a nibble. Is it really because of the spoons? 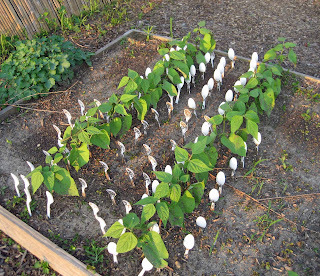 Have I just proven that it is good luck to put plastic spoons all around in your vegetable garden? Now I think I need spoons all over the garden. Death? I’ve carried a hoe in the house plenty of times, who hasn’t, but I must be carrying them out the same door I came in by as there haven't been any deaths that I can relate to any hoe carrying episode on my part. There is another superstition that if you do carry a hoe into your house, you have to walk backwards to carry it out to avoid bad luck. I refuse to believe this is true. I feel like I have lots of good luck and I don’t walk out backwards with my hoes. Maybe carrying more than one hoe in the house switches the luck from bad to good? I’ve done that a few times. In fact, I say it is bad luck to own just one hoe. I’ll just go on record and say the more hoes you own, the better your luck will be, and the fuller your life will be. Do you know of any superstitions related to gardening? Will you be taking a few extra precautions tomorrow, Friday the 13th, to ensure it is your lucky day in the garden? So cool. I had a visitor just the other day who left with some free plants. He REFUSED to thank me because his grandmother taught him that is bad luck and the plants will not grow. I chided him and said no it is not. Guess I learned something new-from a kid half my age and confirmed by you, maybe I need to call him to apologize. carol - i think i've done every single one of these things that you mentioned in your blog that i'm not supposed to do, except be pregnant and plant seeds. No wonder I have such bad luck! Carol, no I really don't believe in bad luck on Friday the 13th. But just in case, I won't walk under any ladders or break any mirrors. This may or may not count as a gardening superstition, but here goes. 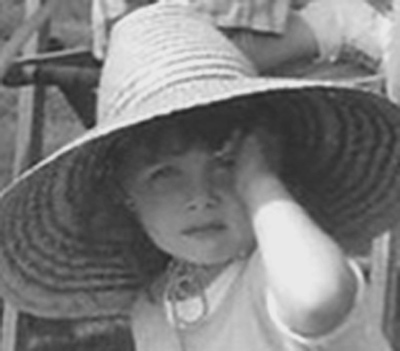 I used to spend the summer months with my grandparents on their farm in S. Indiana. And I always heped with their huge garden. But when I got to a certain age and had a monthly visitor(if you get my drift), my grandma would not let me help with the canning of tomatoes or green beans. I couldn't even break the beans for her when it was 'that time'. She was very adamant about this and always said she didn't want her hard work to go to naught and have the jars not seal. Have you ever heard that one? Other than that, I just want to say thanks for the bean seed info. I should be planting some this weekend, so I'll be looking East and West for the right direction! I don't know about superstitions but the spoons in your garden are great! (Right now, I have straws in the soil where I planted seeds -- that way, I know where to water and where to watch for signs of life). I don't believe in bad luck, but I can tell you that that "seeds sown by a pregnant woman will grow" one is hogwash. I proved it wrong this year. Of course, it doesn't say anything about how often the pregnant woman watered the seeds, or whether she forgot about them for days at a time, or.....oh, never mind. Interesting post, Carol. I'm still fascinated by the spoons. If I have time this weekend I'm going to do some spoon-planting. Do you think it would be good luck to plant spoons on Friday the 13th? I had never heard of any of these supersitiions! Perhaps they are US ones and not UK ones. I would have thought though that it was bad luck to walk backward out of the house with a hoe - surely the chances of falling over are greater!! My aunt, and gardening mentor, taught me, when she gave me my first plants, not to thank someone for a free plant or you've cursed it to die. I always tell people that I am very appreciative of their kindness and know that I'll take good care of them. I've heard that one about not thanking someone for passalong plants and can vouch for its falsity. It's hard for this Southern girl not to say thank you, and yet I have good luck with many passalongs. Not all, of course, but I'm not superstitious about it. I think luck is a state of mind. If you feel like a lucky person (and I do, generally), then you create your own luck by being open to new experiences, trying new things, and feeling optimistic that what you try will work, or that at least you'll learn something good from failure. Feeling unlucky is a self-fulfilling prophecy. I hadn't heard any of those superstitions either. I have my beans planted north-south and they came up just fine! This one has me puzzled, Carol - unless you count the garage as being part of the house, why would anyone carry a hoe or a shovel into the house in the first place? Has the Nightblooming cereus gone so out of control you need a hoe? If you are planning to have people come over and look at your garden, do NOT speak the date of the visit aloud. If you do, the roses and daylilies will hear your plan and stubbornly bloom the day before and the day after but they will not open while the guests are there. I know it's a bit early but my GBBD sidebar slideshow is up for June already as I'll be away on holiday. Its accompanying post will magically appear on the right day, so see you when I get back next week. I showed up here at the end of the on Friday the 13th. I took no precautions and the day turned out just fine. Of course, that was before I knew there were superstitions connected to gardening. Now that you've alerted me, I'll have to be extra careful next time that dreaded day comes around! Annie in Austin, I was thinking the same thing: who brings a hoe into the house? I think Carol threw that bait out to see if any of us fish would nibble! Waidaminit. I have never, ever carried a hoe into the house. "Who hasn't?" I ask, who has? 'Cept you, of course, the hoe queen. Under what circumstances does one actually carry a hoe into the house? What a great idea to find out what's blooming in gardens all over the world! 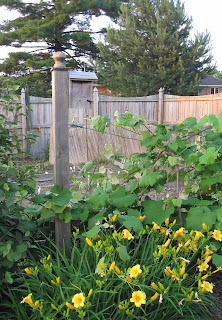 Actually, I keep thinking of flowers I forgot to put on the list, such as nasturtiums. But the heat has just about done them in, so they're only marginally blooming, at best. Hmm. I guess I was not the only one who wondered about bringing a hoe into the house! I usually have time to set mine down leaning against the wall before I walk in the back door. Maybe that superstition came from a person who not only brought their hoe in the house but a pair of muddy boots as well, and the resultant reaction from the housekeeping person made them associate bad things with such bad judgment. Who knows? Perhaps they were even murdered? That could account for the association of "hoe in the house" with "death".